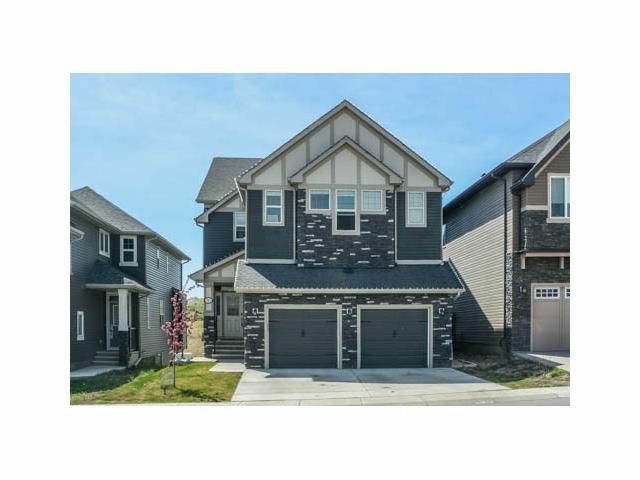 Luxurious 2-Storey WALKOUT, this home offers over 4200sq.ft. of dev. living space, 5 bdrms, 3.5 baths & backs onto quiet ravine w/stunning panoramic views. Main flr is flooded w/natural light & features an open concept design w/private office & lg mud room. The Dream kitchen boasts PRO BRIGADE/VIKING appliances w/36” gas range, extensive cabinetry, pantry, granite, huge island w/wine fridge. Great room is anchored by a Modern gas FP w/stone surround & wired for TV above. The upper floor consists of a stunning Master Retreat w/ SPA-like Ensuite: jetted tub, shower w/massaging pebble floor, dual vanities + make-up counter, juice bar, W/C & large walk-in closet. Completing the upper flr is a bonus room featuring a built-in entertainment center, STEAM laundry, 2 XL bdrms w/ walk-in closets, 5-piece bath & computer nook. The lower walk-out features a bright & open Rec Room, bar, 2 bdrms & full bath. Easily suited w/ laundry roughed-in. Tons of upgrades, extensive sound system & storage throughout. Listed below cost & city assessment!